Opinion is split pretty much 50/50 with regards to this acquisition, fans deploring the move who worry that the beloved franchise will be milked and 'ruined' by the studio who brought you things like John Carter, and those who are ecstatic - another outing at the cinema, new stories, from the studio who brought us Avengers Assemble, Toy Story and The Lion King. I'm still trying to process the news, I've seen it, it just hasn't sunk in yet. When it does sink in, I'll be very much in the 'YAHOO!' camp. I mean, more Star Wars, in the cinema, for the first time. I get to take my son to see a new Star Wars film in the cinema. 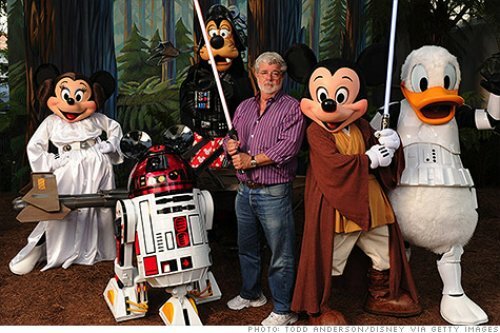 The acquisition also includes ILM, Skywalker Sound and Lucasarts (and I presume all historic rights therein). Could we see another X-Wing/Tie Fighter game? Maybe some new work on the Monkey Islands or Day of the Tentacle/Full Throttle IPs? Lets not forget that Lucasarts brought us Rebel Assault, possibly one of the worst games ever. A lot of the fans disliked the prequels, by the time ROTS was released, I'd forgotten all about the bad feeling from episodes 1-2 and I can now view both trilogies as separate entities and as part of a bigger story. I enjoy watching them all, but of course I have my favourites (Empire followed by Sith). With an endless collection of EU novels, the possibilities are endless. We've seen an older, digitised Skywalker (voiced by Hamill) in the Jedi Knight games taking on the role of the master, leading on new recruits. Imagine what would happen if Disney created the Grand Admiral Thrawn Trilogy? Dark Forces remains one of my all time favourite video games and I played it, religiously, on my Macintosh Performa 5200! Perhaps the FPS franchise will be rebooted?